Years later, on Nov. 21, 2013, students gathered in Saint Louis University’s student union for “The State of St. Louis,” an event planned by a SLU's Political Roundtable. Students sat around tables instead of standing on cars, but that’s not the only difference between student activism today and the sit-ins of the past. Student activists today can use social media to promote their organizations online. While Political Roundtable has 126 supporters on Facebook, roughly 30 students attended their event. Their absence could be attributed to studying for tests or having another commitment, but it could be because of a different phenomenon: slacktivism. Slacktivism is a term for giving token support for a cause, like wearing a pin or “liking” something on Facebook, without being willing to engage in more meaningful support, like donating time or money. And with the presence of social media, being a slacktivist is easier now than ever. A recent study from the University of British Columbia found that when people participate in a form of public token support, they aren't any more likely to participate in a form of more meaningful support in the future. Someone who "likes" a cause on Facebook wouldn't be any more likely to donate in the future than someone who had no exposure to the cause at all. "We found that when consumers gave public support, they were no more likely to provide more meaningful support for the cause than if someone was just randomly asked for the larger request." Kirk Kristofferson is one of the authors of the study. “What we found is that the social observability of the token support really impacted how likely consumers were to follow up and provide real support for that charity," Kristofferson said. "We found that when consumers gave public support, they were no more likely to provide more meaningful support for the cause than if someone was just randomly asked for the larger request." Studies have shown that when people support a cause with some effort, they’re more likely to support a cause with an even larger effort in the future. For example, someone who participates in a 5k run for a charity is more likely to donate in the future than someone who has no familiarity with the cause at all or has done something minimal like joining their page on Facebook. If college students choose to be activists by sharing a link or liking a status, they may not feel more compelled to take real, tangible effort towards social change. How Do Students See Social Media With Social Causes? Back at SLU, T.K. Smith is on the executive board of Saint Louis University’s Political Round Table. He thinks that social media can convince users they’re doing something good even if all they’re doing is pressing a button. "Raising awareness is a lazy objective. Awareness is a given, action is what you want to promote." Another student at Saint Louis University, Christina LaFon, created a Facebook group with the purpose of sharing articles about feminism with like-minded people. But raising awareness, LaFon said, isn't the end goal of social justice, or her own end goal for the group. Advocating for a cause on social media does not automatically make you a slacktivist. LaFon, for instance, has been involved in political campaigning and offline advocacy in addition to the awareness she tries to raise online. Julie Dixon is Deputy Director of the Georgetown Center for Social Impact Communication, and one of the authors of “Digital Persuasion,” a study that looks at how social media users use their influence to promote social change. 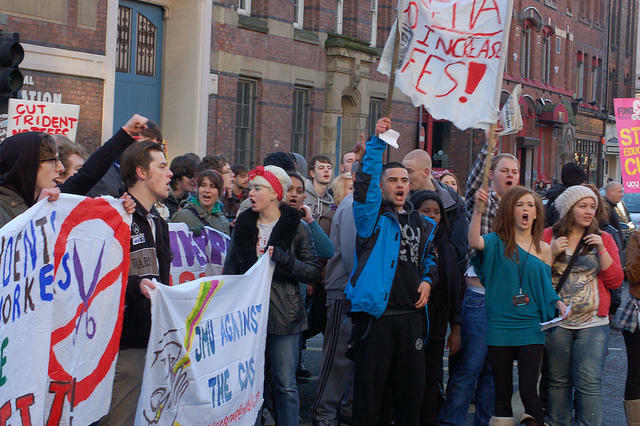 British students continue to protest the high cost of tuition like the Liverpool students pictured here in November, 2010. Despite the potential effects of slacktivism student protests do still occur on college campuses. Just last year SLU students helped organize a sit-in and teach-in in protest of then-President Father Lawrence Biondi, and within the last couple years student protests have gained global attention in Egypt, England and Chile. In many ways, Dixon said, social media makes it easier for students to organize in a way that can lead to offline engagement. Most importantly, Dixon said to remember that social media isn’t a fundraising tool; it’s a relationship building tool. Social causes are helped by social media when you see what your network cares about and decide to care about that, too. Social media allows users to organize, network and share what they’re passionate about in a way that wasn’t available to student protestors in the 60s. It’s now easier than ever to learn about causes and share information, but it's also easier than ever to be a slacktivist. Take a look at some popular token support campaigns by exploring the infogram below. Or, for a look at a campaign committed to combating slacktivism, watch this video from UNICEF Sweden's "Likes Don't Save Lives" Campaign.